The Cincinnati Reds fan who started the Woo thing at Great American Ball Park (GABP) seems like a great guy and is certainly loyal. But Cincinnati Enquirer sports columnist Paul Daugherty has a good--if overstated--point about how annoying all the woo-ing has become. Tony Kornheiser and Michael Wilbon talked about it on Pardon the Interruption on ESPN. Meanwhile, woo-ing fans or no, the Reds enter tonight's game against the San Francisco Giants one game out of first in the National League Central Division. This is a rebuilding year for the Reds. But the way this young team is playing, featuring a surprisingly potent offense and terrific pitching out of the bullpen, the future is looking bright in Cincinnati. Woo! PS: It can get annoying when overdone, but the woo-ing still isn't as nerve-grating as the vuvuzela. Following THE Leader to Life! An old saying tells us that to find out if someone is a leader, just look to see if anyone’s following them. A real leader is one who has earned people’s trust. A real leader is someone who others voluntarily choose to follow because of their willingness to endure everything endured by those they lead. presidents who send soldiers, sailors, and airmen into conflicts they’ll never experience. Folks like these can exert a kind of leadership, of course, especially in the case of larger, more complex entities like countries, corporations, and so on. But leadership, from a biblical perspective, is intensely personal and relational. It’s stunning when we see this kind of leadership in our everyday lives. An acquaintance of ours, son of the congregation I formerly served as pastor, is General Curtis (Mike) Scaparrotti. Scap is now the commander of NATO. By training and experience, he’s a paratrooper, who has served in Vietnam and Iraq, among other places. During one tour in Afghanistan, although a general, he still jumped from aircraft, joining the men and women of his command in missions, subjecting himself to the same risks that he commanded them to take. This exemplifies how the Bible understands leadership. In the Bible, a true leader will never ask those she or he leads to do anything the leader isn’t willing to do as well. In the Bible, a true leader is, above all, is a servant. Leadership of this kind is built on and deepens relationships between people and leader. Once, in Old Testament times, David was leading his “mighty men” in battle against the Philistines. David was in a stronghold while the Philistines controlled his hometown of Bethlehem. 2 Samuel 23:15 says: “David longed for water and said, ‘Oh, that someone would get me a drink of water from the well near the gate of Bethlehem!’" David was in the midst of a war that found him daily giving his all. He was feeling wistful, nostalgic for the springwater of his hometown. His words were only a wish, the kind of thing you say in passing. The true leader never thinks that she or he is entitled to the allegiance of those being led, will not enjoy privileges that can’t be enjoyed by all, and honors the sacrifice, work, and loyalty offered by those that she or he leads. David’s mighty men wouldn’t have undertaken their dangerous mission to get water for just anyone. They did it because David had become their leader. If you want to know if someone’s a leader, look to see if anyone is following. Of course, David had his times of failure as a leader, times when he forgot what it meant to lead. One year, when he should have been leading his armies in battle, he stayed behind. On one particular morning, he caught sight of a woman named Bathsheba, the wife of Uriah, one of David's loyal soldiers. Bathsheba she was bathing and David liked what he saw. He brought Bathsheba to his royal home. She became pregnant. Then to cover things up, he had Uriah killed in battle. It was a monumental failure of David's leadership, for which he later repented. Human leaders, even those who know what leadership is from a Biblical, Christian perspective, even those who seek to lead godly lives, sometimes fail. I know that I have. But, as followers of Jesus Christ, God enfleshed, we have a leader Who will never fail us, Who we can follow with complete confidence! 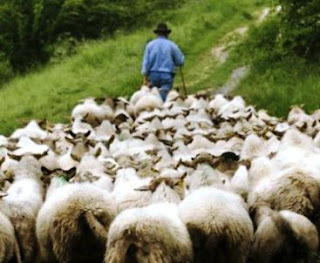 One of the most characteristic word pictures of a leader in the Bible is shepherd. This is a term applied even to God Himself. Our psalm for today, for example, begins with the words, “The Lord is my shepherd, I lack nothing” (Psalm 23:1). No matter how confusing life in this fallen world can be, the good shepherd never tires of looking for those who will hear His voice and follow. No matter how far we may wander from God, when we hear Him call and return to Him, we belong to God forever. In the Middle East of today, as in Jesus’ time, sheep of different flocks may sometimes be held in common pens for a time. But when it’s time for one flock to move on for watering or feeding, the sheep in one flock will not follow another shepherd. They know their shepherd’s voice. They trust him. He calls them each by the names he gives to them. He cares for them. When the shepherd calls, his sheep fall in line behind the shepherd. He leads the way, out front, protecting them. That’s Jesus! When Jesus calls us to take up our crosses and follow Him, He isn’t asking us to do anything He hasn’t already done...for us. The Savior Who calls us to submit our sinful selves to daily crucifixion so that we might rise, made eternally new by God’s grace, has already voluntarily taken on Himself the condemnation of our sins by dying on the cross, then rising again to open up the way of life to all who follow Him. Jesus is willing to be out front, blazing the trail for us, no matter the pain or the cross, in order to lead us to life with God. And Jesus is the only shepherd, the only leader, who can do this for us! There are bogus voices in our world that will lead us down the path to death. These voices belong to thieves: humanly-imagined gods and godlets, none of them like the living God we know in Jesus Christ. They tell us that all religions are the same, that all religious systems are roads to the same God. But Christian faith isn’t a religious system. Christian faith is an intensely personal and eternal relationship that God grants by His grace to all who follow Jesus. In Jesus’ days, the Jewish sect of Pharisees had boiled faith in the living God of the universe down to a set of rules. They had some 600 rules and basically told folks, "Keep these and you're good to go." Like the fake religions of our day--from Islam to Mormonism, from Scientology to Hinduism, from Buddhism to Jehovah’s Witnesses--the Pharisees told people that if they behaved in certain ways, good things would happen. The lying voices of today’s false idols promise people everything from prosperity to satori, from eternal kingdoms on their own planets to the supposed tranquility of nothingness. They all sell different forms of what we call “works righteousness,” programs for earning your worth or your blessings or your better life. But the true leader, Jesus, the high priest who can empathize with our weaknesses and has been tempted in every way, but without sin, doesn’t sell a religious program. Jesus offers Himself, as an act of charitable love from God. Jesus and His righteousness, not us or our religious works, are what earn us life with God. Our job is to surrender our sins and our lives and trust in Him as our only God, our only hope. Well, He doesn’t mean that we’ll be wealthy necessarily. Some Christians are wealthy, most aren’t; but they’re all blessed. Some Christians are powerful, some are good looking, some are influential, some lead healthy, long lives. But even the powerless, the unhealthy, the also-rans of the world who confess Jesus as Lord have life and have it to the full. How much fuller a life can one have, after all, than eternal life with God? It’s a life lived with God not only through the joys and sorrows of this life, but a life lived as it was meant to be lived by people created in the image of God in the first place...then made new by the Savior King Whose voice daily calls us to follow and believe.